Decorative concrete is about being creative and that is what we at World of Decorative Concrete (WODC) are good at. 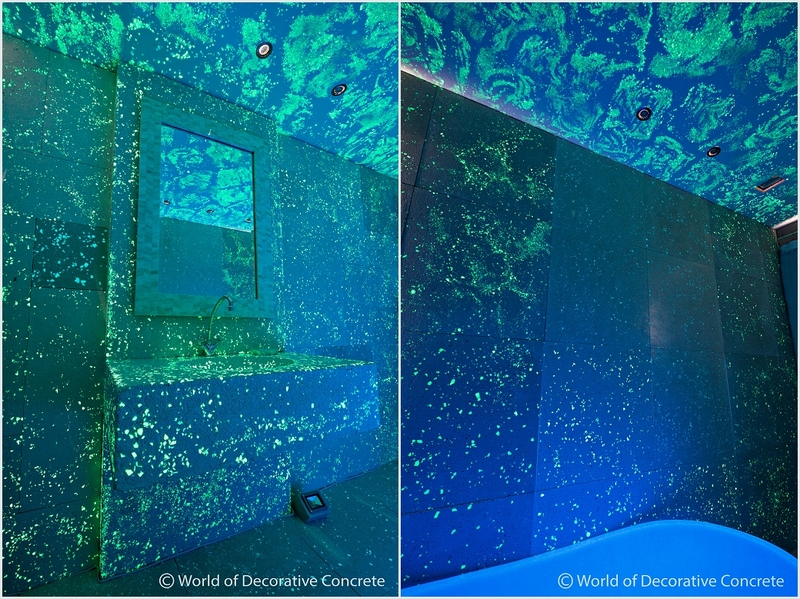 Just picture this: concrete that looks like ordinary concrete during the day, but when all the lights are out it generates a luminescent glow that will last almost all night long – no power source required. This is not science fiction. It’s a possibility today thanks to glow-in-the-dark aggregate. What a wonderful sight when you come home at night – being welcomed by a glowing concrete path that safely guides you to your front door. Or getting out of bed during the night without needing to switch on any lights but finding your way easily with enough light emitting from your concrete floor. There is no dark secret behind this light source. It’s all about the aggregate casted into the concrete. In daylight the aggregate has a subtle, pale colour. Depending on the colour you choose the appearance of the aggregate varies from soft white to soft yellow or soft green. However in the dark dramatic changes occur and the aggregate radiates a bright white, yellow, green, aqua blue or sky blue colour, depending on the colour of the aggregate you’ve chosen. Designed for indoor and outdoor applications, glow-in-the-dark aggregate absorbs and stores natural and artificial light energy, from both the sun and/or artificial lighting. Once the light source is no longer present, the glow-in-the-dark aggregate in the concrete releases its stored energy to provide a self-generating ambient light source. 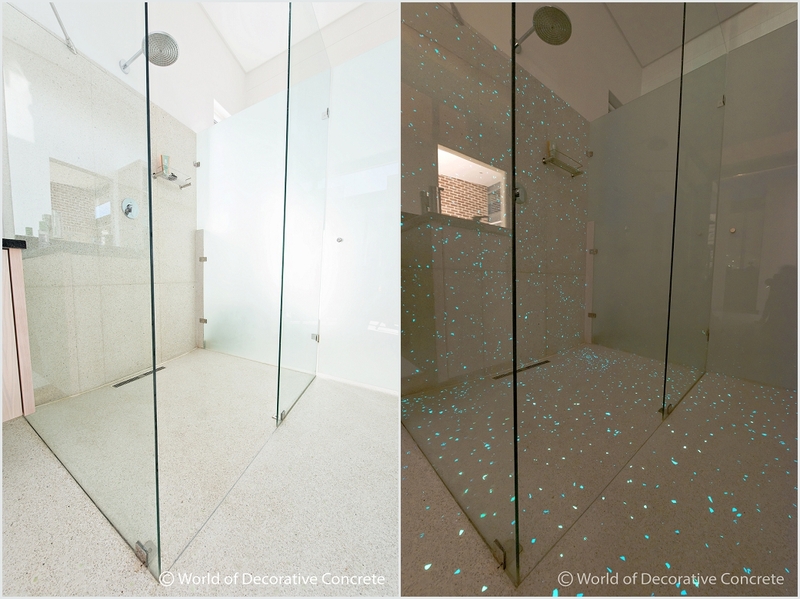 The glow-in-the-dark aggregate manufactured by WODC can be fully charged within 10 minutes when exposed to natural light and/or direct sunlight. When used as an interior application, the glow-in-the-dark aggregate can be fully energized within 15 to 30 minutes, using halogen, fluorescent or LED light sources. 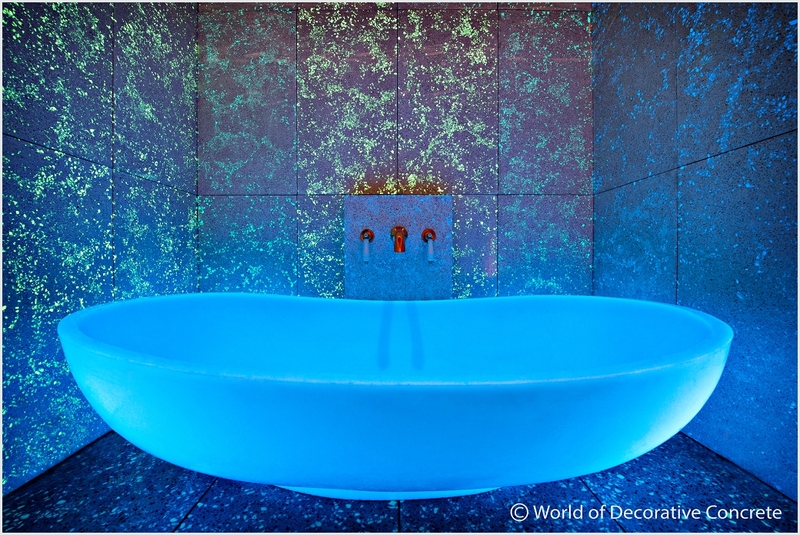 There are many creative ways in which glow-in-the-dark concrete can be used. 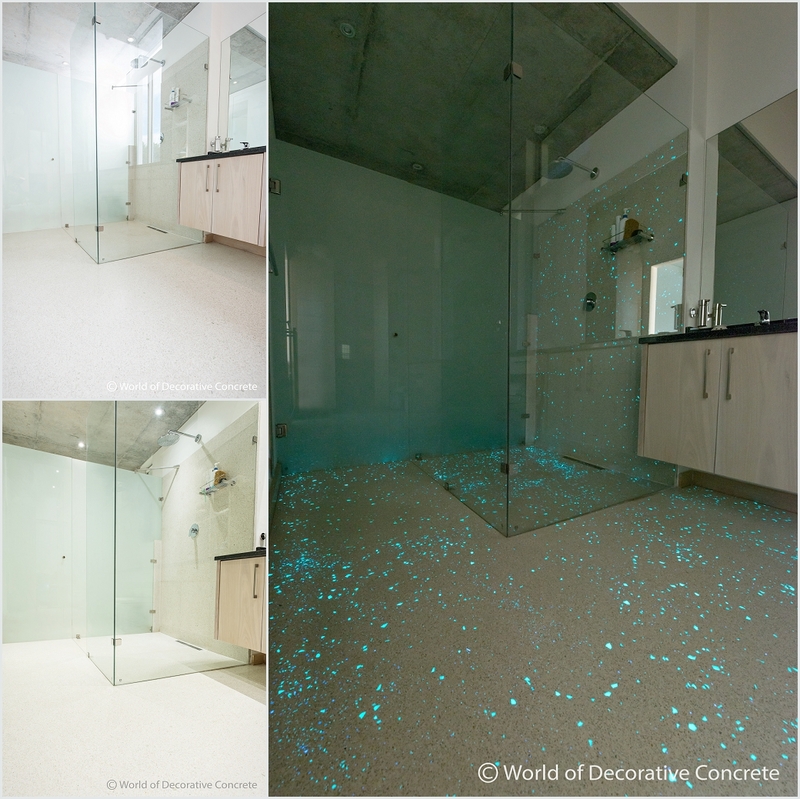 Pool decks, patios and outdoor entertainment areas, kitchen and bathroom floors, countertops, vanities, wall claddings – just about any place in- or outside your house can be enhanced by the magic of glow-in-the-dark concrete. The only limitation here is your imagination. 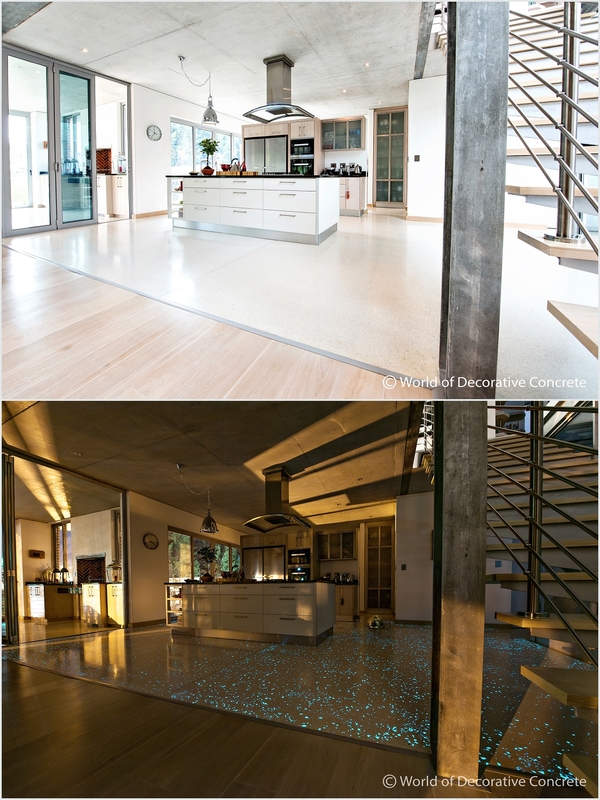 Do away with dark stairways or hallways by introducing glow-in-the-dark concrete. It’s time to let the light in. The glow-in-the-dark aggregate must be exposed on the concrete surface and can be used in the same way any other decorative aggregates are been used. 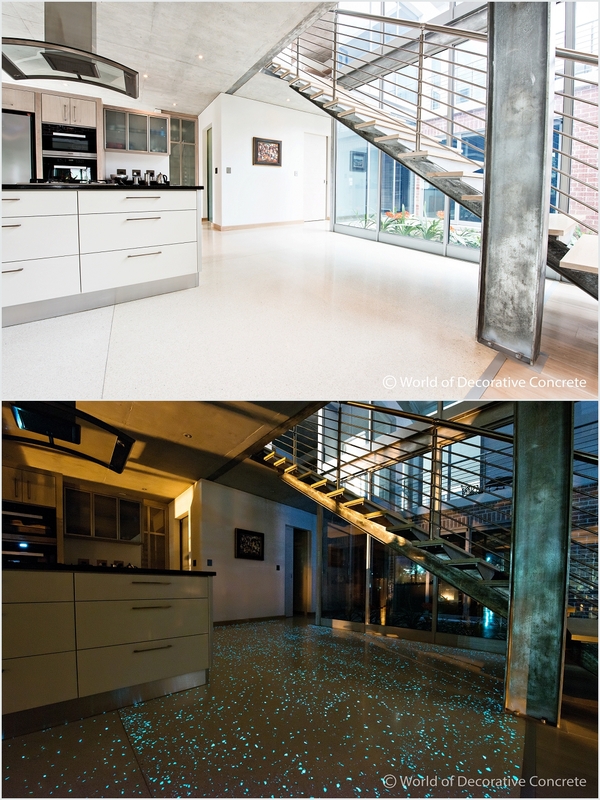 At WODC we mostly use glow-in-the-dark aggregate in ground and polished concrete products where the aggregate is exposed during the grinding and polishing process. The glow-in-the-dark aggregate will continue to glow for more than 20 years, with a glow degradation of approximately 2% per year. Glow-in-the-dark aggregate is a non-toxic photo luminescent material. This remarkable aggregate does not shrink or expand in the concrete, regardless the severity of weather conditions! Polished concrete consists of cement, sand and natural stone as aggregate. It is important to wisely choose the colour cement and natural stone aggregate to combine and blend well with the colour of glow-in-the-dark aggregate you choose. 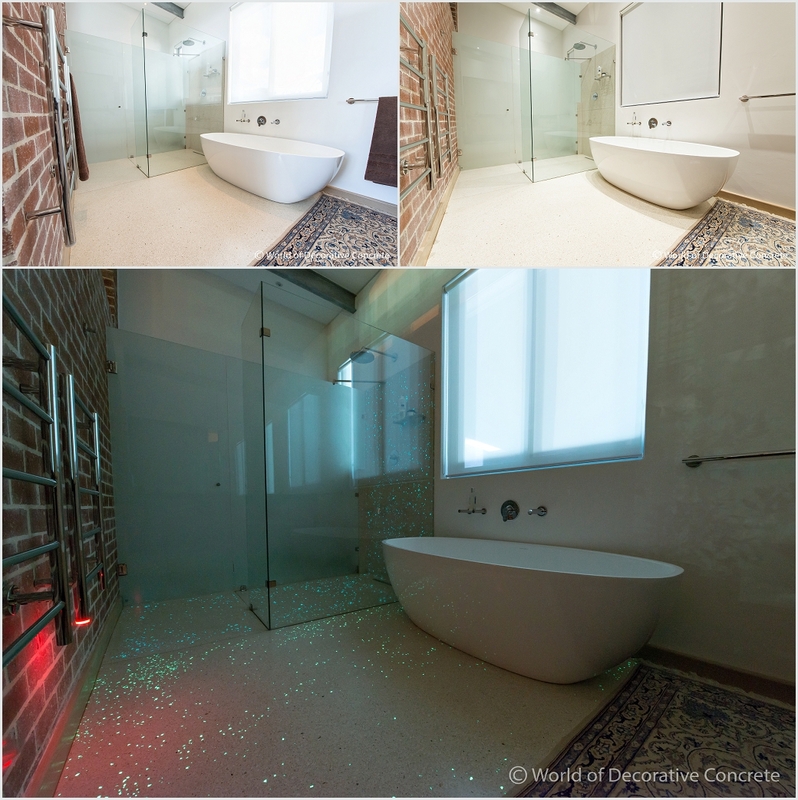 WODC successfully used this glow-in-the-dark technology in the fabulous house featured in this article. The owners chose a white polished concrete floor, with a creamy colour stone aggregate. The end result is a combination of colour and texture that blends extremely well with the glow-in-the-dark aggregate. 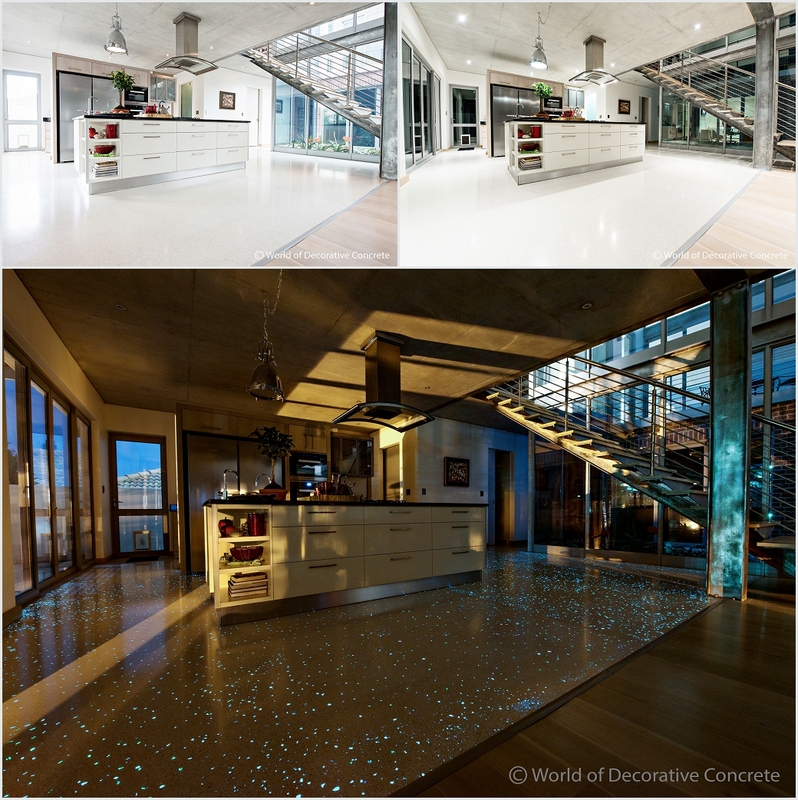 World of Decorative Concrete (WODC) is the only Decorative Concrete company in South Africa that specializes in Glow-In-The-Dark Concrete.